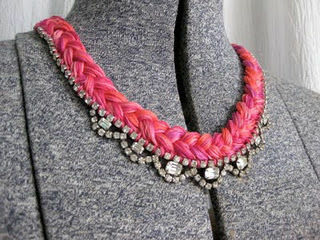 https://www.cutoutandkeep.net/projects/diy-embroidery-thread-and-rhinestone-necklace-2 • Posted by Erin P.
Why spend $500 when you can make your own one-of-a-kind necklace using embroidery thread and costume jewelry? It's a great way to update old pieces in your jewelry box. 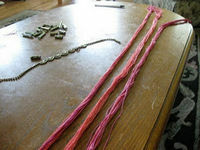 I began by unwinding the skeins and making three bundles (of three skeins each), a little over three times the length of my necklace. 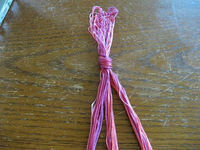 I tied the ends together, keeping the bundles separate, then began braiding. 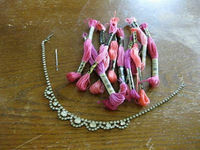 You'll need to save a piece of thread about twice as long as the bundles for attaching the necklaces together later. 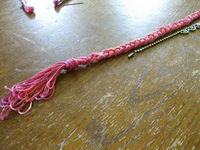 Continue until the braid is about 3 inches longer, on each end, from the necklace, then knot the loose strings. I trimmed down the remaining string on each end. 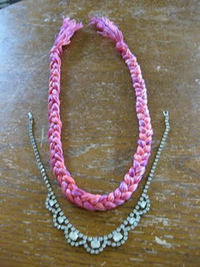 Next, I lined up the necklace with the braid, and made note of where I wanted the rhinestone necklace to become attached. Thread up a needle with string, and tie the embroidery thread around some strings of the braid. 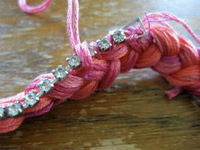 I used the needle to sew the thread through the braid and wrapped in between the rhinestones. 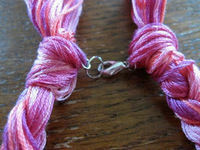 At the end of the necklace, I tied off the embroidery thread and tucked in the loose ends. With jump rings, attach to the string a larger ring and clasp. You're done!